Once again, no decade looks more fun the 1950s. The way the middle gal set her hand upon her hip says it all. All-American teens going back to school in style. I can even overlook the ginormous genie/perfume bottles in the background. Well they are pretty well dressed. And look at that guy’s nifty sweater. To me nothing says 50’s like Evening in Paris perfume bottles. I wonder what a morning in Paris smells like then? It does look like her! I would imagine this was a short-lived ad campaign. The word “tang” became proprietary when “Tang” was invented in 1957. I really like the belt buckle on the center girl. I think she may be Romulan – it’s the hair cut. Taste its extra-brite tang?! That just sounds threatening! 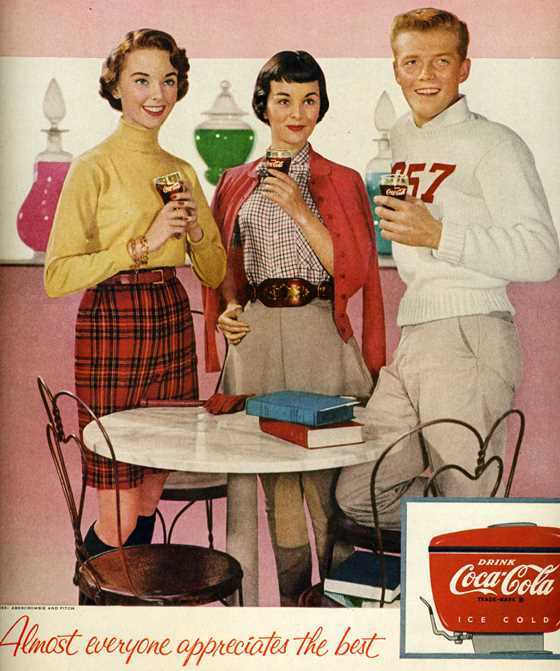 It is funny how Coke kept advertising itself as “extra-bright” in those little blurbs. Apparently “extra-bright” was the thing to be back in those days! I’ve told Arto for years that if I had to choose a “Worst job for Dave”, it’d probably be confectioner, because I’m just not the kind of the person who would like to (or perhaps even be able to) focus on the nuances of sugary foods. …I guess that’s the kind of thing that happens when the kind of person who enjoys your show is also the kind of person who doesn’t even have a TV! Also, why is it “ALMOST everyone appreciates the best”? Doesn’t everyone appreciate the best? Haha good point! We can’t all be right all the time… that’s what makes life fun… I think? I’m one of those people who enjoys beer in all of its shapes and sizes… except watered-down Colorado beer, which I’ve been ranting with Mark B about on his blog! Like Coors Lite, ie piss water? Yes, except even the good micro-brews from out of state have to get watered down! Okay, that is not even alcohol. That is Kool-Aid. I don’t buy beer < 5% and it upsets me when I have to scour the grocery shelves for something a grown up can drink. That is crazy talk. Are they high? So I guess Tang wasn’t out on the market yet, Kerbey, or Coke copywriters would not have given it all that free advertising.